Good evening! Tonights card was made for a challenge over at Paper Cutz! Mary had a great challenge this week to create something with wheels. I knew this was the perfect chance to use my new Imaginisce stamp. I also love note cards so that is what I chose to make. I stamped the image in Staz-on and then water colored it. 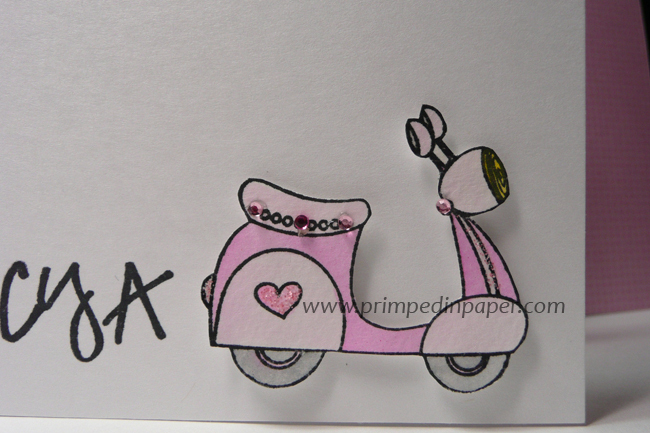 Next I added tiny pink bling and stickles to the scooter. 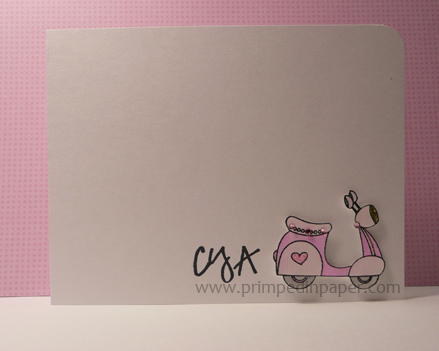 Then I popped the scooter off the card base with 1/16 inch pop-dots. The sentiment is from The Paper Company. Thank you so much for taking a peek at my card. Let this little note card say it for you! A little bling and stickles always make images more fun!